toss it all in the food processor, then add the avocado and pulse until smooth and awesome. Season to taste with salt and pepper, and prepare to be amazed when you try it on a yellow corn chip... The second component for these tacos is the potato-chorizo filling, which was the perfect chance to pull some of my homemade Mexican Chorizo out of the freezer and put it to good use. then added to the chorizo and onion mixture, where the potatoes can absorb the chorizo-y goodness. The chorizo filling can be made ahead, so we did all of the cooking up to this point in the morning. After making the Simple Avocado Salsa, however, I read that it only stays fresh-tasting for an hour, so we had to have the first batch for brunch and make a second batch (as alluded to above) for dinner... On to the next tacos. As I mentioned, these are something I was sure I had made before, but upon closer inspection I determined that I had never actually read the recipe when making this dish in the past. How do I know for sure? The recipe calls for everything to be cooked in flavorful pork fat or bacon fat. I am not a woman who cooks things in non-bacon fat substances if bacon fat is recommended, so I must have never seen this brilliant, brilliant suggestion. The first component I prepped is your basic pico de gallo. (No recipe was included in the book, just a suggestion that salsa accompany... although I now see that Bayless's Roasted Tomato-Green Chile Salsa was recommended... Dammit. I am the world's worst recipe-reader...) Anyway... I made pico de gallo, and it was delicious. I'll have make the other salsa next time. Next up were the Blistered Serranos and Browned Onions, aka The Coughing Onions. You start off with stemmed serrano chiles: These are quartered lengthwise with the stem end left intact, then added to a hot cast iron skillet containing some bacon fat. The onions are added next, and the charring and browning commences. I always used to do this on the grill when I thought I was making this recipe before, which avoided a situation in which the air in my kitchen was completely filled with capsaicin. My exhaust fan is pretty much useless, so we had to run out for fresh air a couple times during the cooking. In the end it was worth it, though, with a result far more beautiful and flavorful than I ever got on the grill. When the onions are finished, a bit more bacon fat goes into the pan (brilliant idea, Rick!) and the well-salted steaks are added to sear until cooked to your liking. I went off-recipe one more time here, not wanting to leave that any charred goodness behind in the pan, and decided to deglaze with a bit of lime juice, then pour that liquid over the steaks. I can't be certain, but I think Rick Bayless would have approved of this step. The result was absolutely delicious. then gently flatten and execute my patented 270°-flip-turn three times to get a nice round raw tortilla. You can make several a little bit ahead and leave them between the plastic sheets to stay moist until a pan frees up to cook them in. I put my mom on tortilla-pressing duty and manned the cooking station myself. The first side should be cooked over medium-low to medium heat until just cooked enough to be flipped onto the other cast iron skillet, which is over medium to medium-high heat. and Seared Steak Tacos This was so good and was exactly what I was craving. I think I preferred the steak, just because the flavors were so clean and classic, but the chorizo was really unique and interesting and delicious in its own way. I've really missed quality Mexican food since leaving SoCal and, while I still wish there was an awesome trashy Mexican joint around here, getting back to cooking from this book should definitely be able to tide me over between trips to the west coast... 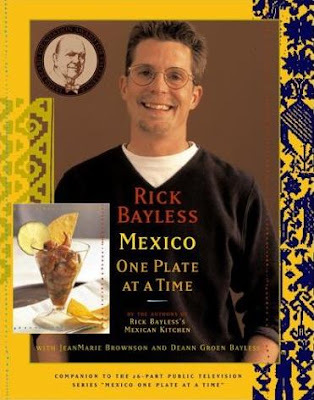 I'm so glad I finally buckled down and did (mostly) what Rick Bayless told me to. The man obviously knows what he's talking about.